Australia has had a vibrant architectural history, one which has seen the rise of iconic structures such as the Sydney Opera House and the new Parliament House. Australia is a large country, however, and the architecture has developed differently from one region to the next to account for weather and other conditions. Perhaps the most distinctive design can be found in the “Queenslander” – a building that is raised off the ground by being set on stilts, with the area underneath the floor providing ventilation against the hot Queensland weather, and the raising of the floor protecting the building from termites and other pests. Equally important in the development of the “Australian style” is the use of local materials, such as the corrugated iron roof. Anyone who has heard the sound of rain on an iron roof knows that they are inside a classic Australian home design. The majority of the early permanent buildings in Australia were built for civic purposes. For example, the first permanent building in Sydney was Fort Phillip, built in 1804, the site of which also included a military hospital and the Sydney Observatory. Right from the outset Australian architecture included buildings that both dominated the landscape around them, and those that were designed to blend in with the local environment. There have now been many Australian buildings that have achieved World Heritage listing, but the first to be recognised was the Royal Exhibition Building, built in Melbourne in 1880 as the wealthy (thanks to the gold rush) city was planning a show of cultural, technological and industrial achievements. Early buildings naturally reflected Australia’s close relationship with the United Kingdom, with the façade and interior designs alike showing a commonality to fashions in the UK at the time. This all started to change around the First World War (1914), however, as supplies and tradesmen became scarce, and Australians looked for ways to reduce the cost of construction. The solution was low-ceilinged bungalows, which were common from 1915 to 1940. These were simple, plainly designed buildings, more for function than embellishments. Even sharper cost saving measures were taken following the Second World War, when the Australian suburbs started to develop their identity. A hodgepodge of walk-up flats to town houses, villas and dual occupancies focused on a maximum use of space, and these buildings were made of everything from weatherboard to brick veneer and asbestos cement. Australian architecture now is world class, with architects again focusing as much on style as function. The wave effect of the new UTS building in Sydney is completely different to Gregory Burgess’ work to make the Kata Tjuta cultural centre at Uluru truly reflect the desert landscape of Australia, but both are very much Australian designs, showing the vibrancy that we now have in our buildings. Where Australians once used some truly hazardous materials in the construction of their buildings, these days things are a lot different, and there is a push to use more sustainable and safe materials. For the framing lightweight materials have become vogue, using either steel or timber. There are pros and cons to using both these materials, but considerations in whether to go for steel of timber include structural capability, thermal performance, sound insulation, fire and vermin resistance, as well as durability and moisture resistance. Most modern Australian homes use bricks, for their long-term durability and the relative ease in which the can be transported and installed into a home. Brick materials can range from tile to glass, but the most common materials in Australia are concrete or clay. Most Australian homes also have a concrete slab floor, though people are increasingly searching for alternatives, as concrete manufacturing has a significant impact on the environment. Concrete slabs, when polished or tiled and properly insulated are a big help in improving the building’s thermal comfort. For roofing, while it’s a more expensive option, many Australians continue to prefer corrugated iron for their roof. This material is popular as it lasts for a long time (up to 50 years, compared to as little as 12 for other materials), and helps control the temperature in the home by reflecting light during the scorching Australian summer. One other common trend that has emerged in the building of new houses is the desire to have “green roofs.” A green roof is one that supports living vegetation, and in addition to the pleasing “green” look, this roofing technique improves the building’s ability to cope with heavy rains, the thermal performance of the building, and can even supply the home with edible food. Every region in the world is prone to some kind of natural disaster, and locals will always build their homes to try and mitigate that disaster. Japanese buildings are designed to be flexible so that they don’t topple in an earthquake, where in South East Asia people build there homes on high stilts so flood water passes underneath. Australia is susceptible to bushfires, and over the years local architects and builders have developed strategies to minimise the risk that a bushfire will impact on a building. All exterior walls, roof, veranda or decking be constructed from non-combustible materials. Local councils are tasked with zoning areas of land that are designated at risk of bushfires. Before you buy a property, you should check with your local council to determine whether it would be in a bushfire-prone area. It’s important to do this, as constructing a building according to AS3959 standards does add some cost to the typical construction. These costs have indeed become something of a controversy, with more people criticising the standards as adding too much to the overall cost of a building. There are estimates out there, such as done by the City of Swan in Western Australia, that argue that a fire-resistant home costs just shy of $21,000 to build above the typical cost of a home. However, as this article in The Conversation shows the fire-prone areas are already more expensive to build in because of their climate conditions. To have a building that is comfortable in these areas is naturally going to cost more to build than a building in the suburbs of a city, for example. Fibro, a material that emerged in the post-war period was cheap and robust. It was outrageously popular as it allowed families to set themselves up in the suburbs with their own plot of land and home for a fraction of the investment. Of course, fibro back in those days contained asbestos, and asbestos is a bad thing indeed – any fibro building created before 1980 has asbestos dust in it. These buildings are safe to reside in, as long as you’re not disturbing the asbestos, but nevertheless, knowing what we know now, a lot of people are uncomfortable with the idea of living in a home built with fibro. But with the cost of home ownership rapidly escalating in Australia, people are again looking to cheap alternatives in building materials, and an asbestos-free variant of fibro has been developed in order to fulfil that demand for low cost, resilient materials that can also help with the thermal control of the home. Then there’s the really innovative stuff. ICF blocks are almost like LEGO blocks on a grand scale. ICF blocks are built from expanded polystyrene foam and are hollow inside, while internal plastic ties provide support across the block, and can hold metal rebars in place. 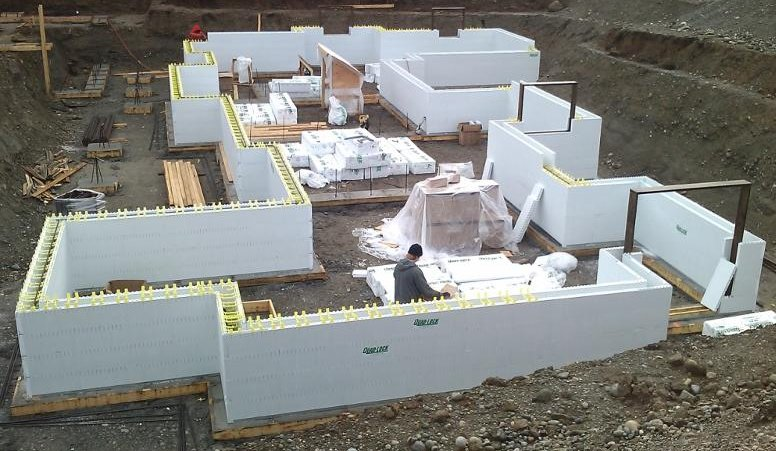 Because these blocks “snap” together so effectively and it’s easy to install plumbing and electrical within them, ICF blocks allow for a very rapid speed of construction. Their design also provides exceptional levels of both thermal and acoustic insulation and help to keep the home both quiet and temperature comfortable. The material that goes into the blocks is also all non-combustible, and therefore can be used in bushfire-prone areas. The only downside to these blocks is that they’re not going to make the environmentalists happy, as they are a sharp net negative impact on the environment. At end of life, the foam that forms the core component of the blocks is generally not recyclable and needs to be replaced wholesale, meaning that a significant amount of the house is destined to be landfill. Still, on a price comparison, ICF buildings come out at about the same as more conventional building systems, and the advantages that this material provides can lead to some spectacular, cutting-edge homes that are perfectly suited to Australian conditions. “Adaptability” is the key word to describe Australian home construction in the past, and it will continue to be the case into the future. The history of Australian architecture has shown that, from the very start, people who live in this country have an intuitive understanding on how to live with it, and have developed their homes to take into account the environmental and social conditions of the time. Where necessary, Australians have also been very innovative. When it was important to cut costs in home building materials, we found ways to do that en masse. As more people have become environmentally conscious, “green” homes have become a realistic option within the budgets of most people building homes. And, as we’ve become more aware of how to build a home to resist the very real bushfire threats in Australia, we’ve found ways to keep Australians as safe as possible in sharp conditions. Innovation in building materials, design, and construction of Australian homes will continue into the future. What is most key about the development of architecture in this country is that it is, ultimately, a creative endeavour, and Australians can expect that their ideas for the perfect home can be realised through the right selections of architect, builder, and materials.